I should have just taken my needles out at that moment and casted on. We were sitting outside of one of our favorite bars in Hoboken, O'Neill's, on a lovely summer afternoon watching "Lebron-gate". The total absurdity of this decision-show was entertainment enough but when he finally revealed that he was going to the Miami Heat was when things started to get interesting. "Oh, you know what that means!!" I said to David over confidently (as drinking several glasses of wine tends to do to my level of psyche). I also speak with my hands so imagine me flailing them around, too. "Pat Riley is SOOOO coming out of retirement to coach this dream team!! Just you wait." "Hell Yea! He wouldn't want to miss the chance to take over and claim credit. DEF-FIN-NIT-LEE!!" Somewhere in his vast knowledge he apparently had access to Pat Riley's psyche or perhaps had once read the operations manual of the Miami Heat and KNEW that this simply wasn't going to happen. Fast Forward to today – it's the Playoffs. The Big 3 are playing and Mr. Riley is no where near court side. Sure, while it seems that he is never going to be a Head Coach again I did enjoy some confirmation from my favorite show, PTI. "My Boys", Tony Kornheiser and Mike Wilbon hinted that my idea wasn't ALL that far fetched but still, it didn't happen. I should consider knitting them both hats for just backing up my logic. Now some of you may notice that "Lebron-gate" was ohhh I dunno last summer? And yes I haven't finished those socks yet. I'm greatful David doesn't employ hit men to collect because I would be The Guy a few bucks short. Just give me More Time!! 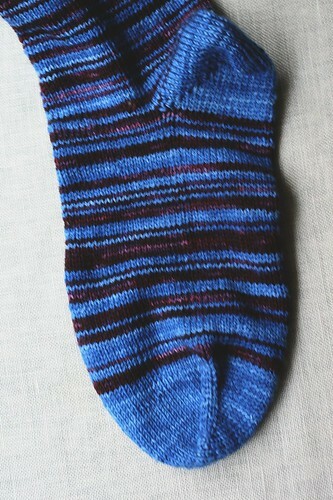 I tried employing the Fibonnoci Sequence for the stripes in this sock. Really it's not a sequence at all it's just me knitting at random using Fib's numbers 1, 2, 3, 5, and 8 for the row count for each stripe.David would inform you that it's neither Fibonnoci or a Sequence just plan random. Well it's all Fibonnoci to me! David, by the way, is a prolific knitter and has always amazed me with his creations. Where I think "hat" he thinks "hat based on the principles of fractal geometry put forth by Benoit Mandelbrot." Oh, Ok. What amazes me most of all is that his hats are so unique and when he gets a compliment he is likely to just shrug shoulders and simply say "thanks." 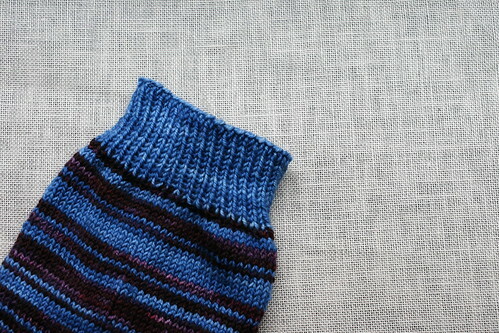 David is blogless but you can find more of his wonderful knitted creations on Ravelry as dklueger. My lesson in all of this? Never make a bet with David and stick to the blackjack tables. 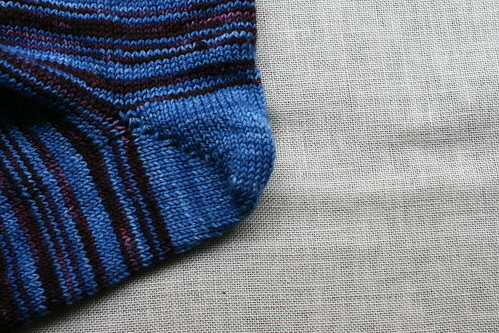 The socks are looking great so far! good colour choices. That triangle hat is amazing! Based on fractal geometry, haha. I love that. We all have had “wine muscles?” With Ma-Kluuger… only some of us cave. You stood strong and knitted him socks he will love for it! 1.21 gigawatts…. love it! Love you! 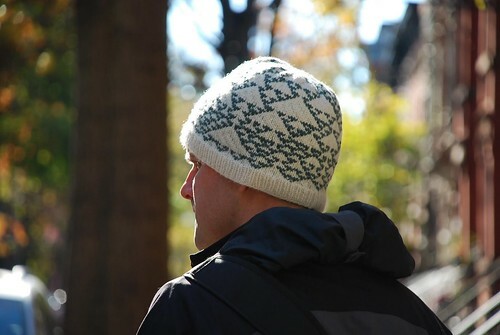 Cute guy in the triangle hat….